Der Artikel Patrick Rothfuss: The Name of the Wind wurde in den Warenkorb gelegt. 'I have stolen princesses back from sleeping barrow kings. I have spent the night with Felurian and left with both my sanity and my life. I tread paths by moonlight that others fear to speak of during day. I have talked to Gods, loved women, and written songs that make the minstrels weep. My name is Kvothe. You may have heard of me' So begins the tale of Kvothe - currently known as Kote, the unassuming innkeeper - from his childhood in a troupe of traveling players, through his years spent as a near-feral orphan in a crime-riddled city, to his daringly brazen yet successful bid to enter a difficult and dangerous school of magic. In these pages you will come to know Kvothe the notorious magician, the accomplished thief, the masterful musician, the dragon-slayer, the legend-hunter, the lover, the thief and the infamous assassin. Patrick Rothfuss, geboren 1973 in Wisconsin, unterrichtet als Universitätsdozent und lebt in Wisconsin. In seiner Freizeit schreibt er satirische Kolumnen. 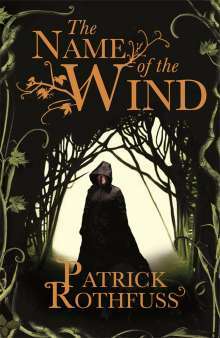 2007 wurde Patrick Rothfuss mit dem Pulishers Weekly Award für das beste Fantasy-Buch des Jahres ausgezeichnet.